Michelle - they were nicer to me - the one lady even said she was surprised that she hadn't scared me off! 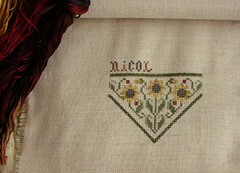 Julianne - I'm using 32 ct. Glenshee linen. I cut it down the middle - I'm thinking of using the other half for Lizzie Kate's new monthly series. Love your Sunflower bellpull :-)! Your bell pull is lovely. Glad you had a better experience at the LNS.